Some students have chronic illnesses and mental health problems that keep them from attending school regularly. Schools and communities can provide support to meet their health needs. The Healthy Schools Campaign created a six-part toolkit for educators with tips, case studies and proven school-based interventions to support students with high absenteeism. ￼￼￼￼￼￼￼￼￼￼￼Children who live in public housing, move frequently or are homeless often miss too much school. Housing authorities and homeless shelters are taking steps to address absenteeism. Walking School Bus Some students miss school because of neighborhood violence or dangerous intersections in route to the campus. Schools and communities have started creating “Walking School Buses” and other approaches to keep kids safe. Afterschool Programs: Research shows that good afterschool programs can improve school-day attendance. Ensure that schools with high chronic absence rates have access to quality programs, and work with providers to target at-risk students. Recess: Physical activity at a well-run recess can make for more engaged students—and better attendance. A school in Boston found that the average number of absences dropped 78 percent after using Playworks. Breakfast in the Classroom: Students who eat breakfast at school attend an average 1.5 more days of school every year. When offered in the classroom, breakfast can be an opportunity to bond with the teacher and get kids ready for class. In Central Texas, the E3 Alliance brought together education, community and business partners to undertake one of the largest in-school flu immunizations campaigns in Texas history. More than 6,500 free vaccinations were given at 56 elementary schools in five school districts in 2014. The group had collected detailed information about why students in Central Texas miss school and found that 48% of true absences are due to colds, flu and other acute illness. In Los Angeles, breakfast can be a powerful draw. At 52nd Street Elementary School in South L.A., 850 students joined a breakfast-in-the-classroom program in October 2012. The percentage of kids with perfect attendance shot up dramatically, and the only thing that has changed is breakfast. 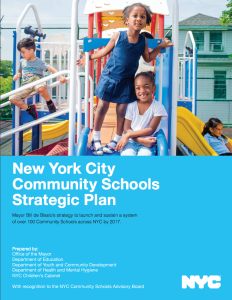 In New York City, the mayor’s office and the Department of Education have launched a pilot program to give designated school staff real-time access to select client data from the NYC Housing Authority, Department of Homeless Services and other city agencies. The data-sharing pilot will provide educators opportunities to provide targeted services for students who face obstacles to attendance, including homelessness.